Wonderful Dreams of True Friendship: Heartcatch Precure! There’s something special, really special, about Heartcatch Precure!, so much so that I think the best way to properly convey its brilliance is to take the long, scenic route to introducing it. It’s a show whose strengths can be subtle yet obvious, and I want to really give the show its proper due as a noticeably strong piece of fiction which utilizes nearly all of its elements intelligently and artistically without ever losing its sense of fun. The premise is simple and familiar. A heroic figure, Cure Moonlight, suffers a traumatic defeat, and in desperation sends two young fairies to Earth to find two individuals capable of taking her place. The first girl is Hanasaki Tsubomi, a young girl and recent junior high transfer student who loves flowers. Tired of her meek personality, Tsubomi sees the move as an opportunity to turn her life around. The second girl is Kurumi Erika, an aspiring fashion designer who immediately sees Tsubomi as a friend, but whose eagerness and hyper disposition exasperate and overwhelm Tsubomi. 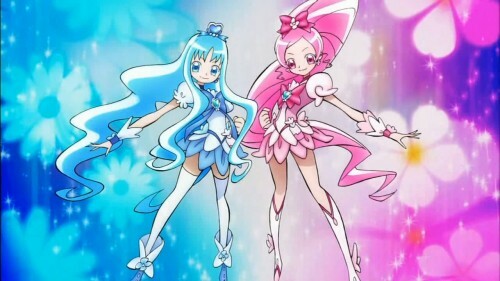 Together, they become Cure Blossom and Cure Marine, fighting against an evil group whose goal is to transform the Earth into a wasteland by feeding off the fears and doubts of humans. Pretty typical on its surface, Heartcatch Precure! manages to go above and beyond through not just its technical execution but what I would actually describe as “heart.” One of the most prominent aspects of the show for me is the mature and helpful manner in which it discusses a variety of serious topics that not only kids but even adults can grapple with in their daily lives, and this complexity tempered by graceful simplicity extends to all areas of the anime as well. In terms of visual design, the character designs are less stiff when compared to typical Precure designs (or even anime characters in general) without being overly esoteric, and the pastel colors and free-flowing line work breathe a sense of vibrancy into them. 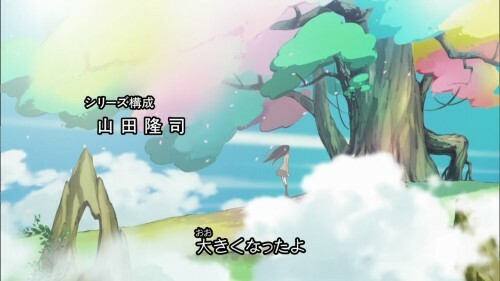 This in turn makes both the show’s action and non-action scenes stand out in a manner reminiscent of Casshern SINS (no surprise given that they share the same character designer), trading the dreary, post-apocalyptic world of that anime for one whose messages of hope and growth are more apparent. The narrative is also bolstered by the visual aesthetics, as they are able to support the strong characterization found in the show through their sheer energy, whether they’re laughing or crying or just walking about. Right from the first episode, the characters are remarkably complex and their interactions dynamic and fun. Of particular note is Erika (pictured left), who I find to be an amazingly well-rounded character who complements Tsubomi well, and whose traits give her not only a lot of fundamental strength but also room to grow. 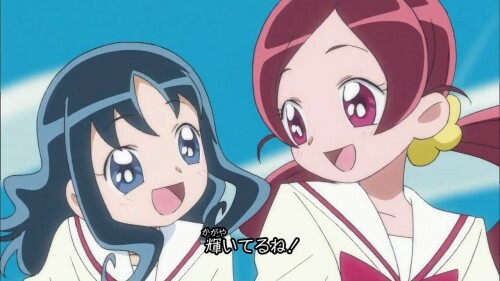 While the Precure franchise has always been about the contrasting personalities of its main characters, Tsubomi and Erika are not so easily divided into opposing categories like “smart” vs. “athletic,” or “loud” vs. “quiet,” though they exhibit such differences to a certain degree. As the show progresses, rather than trying to make up for each others’ weaknesses, the girls learn from each other and deepen their friendship, and it’s a wonderful thing to see play out. Going beyond the main two, the character Myoudouin Itsuki provides another interesting example. Itsuki, being the successor to her family’s martial arts dojo, crossdresses in order to represent her status as “next in line.” Unlike many other shows, however, Itsuki’s issue isn’t about whether she feels any bitterness towards having to act as a “man,” but whether or not the amount of responsibility and pressure she’s willingly put on herself is making her disregard her own feelings. This more thorough, yet still relatively simple, psychological exploration contributes to the show’s strong sense of characterization. 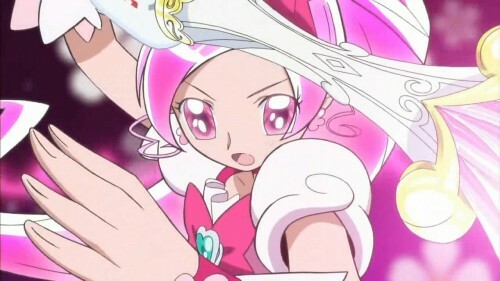 Perhaps the greatest strength of Heartcatch Precure! can be found in the way it shows that there is life beyond the immediate. Notable in this regard is the establishment of the character “Dark Precure” (the one who defeats Cure Moonlight at the start) as a powerful antagonist who completely outclasses the heroines and who continues to be a legitimate threat every time she appears. This is a rare feeling in previous Precure series, and part of the show’s draw simply has to do with seeing how the girls can manage to overcome this seemingly insurmountable obstacle, an adversary they are actually unsure of how to defeat. By far the best representation of this broader perspective, however, comes from the fact that Heartcatch Precure! acknowledges the world past junior high. In every other Precure series, none of the main characters are ever older than 15. Once they hit the end of their third year in junior high(9th grade in the US and other countries), the show ends and nothing more is ever seen of them, and even when they appear in the crossover movies, they are always portrayed as still being in junior high. Heartcatch Precure! bucks that trend. Cure Moonlight is 17 years old. Tsubomi’s grandmother, who is in her late 60s, is actually a former Precure herself. These older figures not only guide the younger Cures through their experience, but also learn from the younger girls’ optimism and zest for life, making it less of a one-way street and more of a mutual growth which spans generations. My fondness for Heartcatch Precure! is quite obvious at this point, but I do think there are areas where it falls short, and I feel that the best way to sum up my criticism is to compare it to Ojamajo Doremi, a similar magical girl show which actually shares much of the same staff. In that light, I find that the biggest flaw in Heartcatch Precure‘s is how “beating up the enemy” is too often the solution to a character’s problems, even in situations where fighting has little to do with the dilemma at hand. Granted, it’s certainly not the only show in the world to do this, but I know Heartcatch could have done better in this regard, especially given Doremi. In contrast, Doremi‘s most glaring problem, the blatant toy-pushing aspect of the show, is handled far more gracefully in Heartcatch Precure! Owing to the strong visual design of the show mentioned before, the transformation sequences and the special attack animations so typical of the magical girl genre almost never feel tiresome because of how lively they are. Watch Heartcatch Precure! If you’re not that big a fan of magical girls, if you haven’t enjoyed the Precure franchise in the past, I think this is a really good place to start. It exceeded my expectations in almost every way, and it might do the same for yours. Just keep in mind to not expect too much to quickly and enjoy the show at its own pace. This entry was posted in anime, mahou shoujo, pretty cure, review and tagged heartcatch precure, precure. Bookmark the permalink.